Can I Get Dental Implants in Wethersfield with Gum Disease? Do you have missing teeth that have been causing you problems? The quality of your life has declined because you can’t enjoy the foods you love and can even experience embarrassing speech impediments in front of your friends. It’s time to replace them with dental implants in Wethersfield! The only problem is that you already have another dental problem: advanced gum disease. Learn about whether dental implants are the right restoration for you in this week’s blog post. 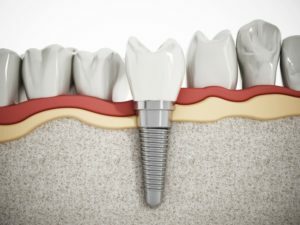 How do you know if dental implants are right for you? A good candidate for dental implants will have a strong jaw bone.Having a dense, healthy jaw helps to keep dental implants in place. The perfect dental implant candidate will have a true commitment to excellent dental health. The ideal candidate for implants will be committed to taking exceptional care of their smile and their replacement teeth. A great candidate for dental implants will have great gum health. Pink, strong gums help to keep your teeth in place and provide a sturdy foundation for your implants. Why are healthy gums a requirement for dental implants? As mentioned above, having great gum health is very important to implant success. If you don’t have healthy gums, your implants could fail, become loose, and fall out along with your natural teeth. So, if you have gum disease or it’s advanced form, periodontal disease, you’ll need to seek assistance from a dentist in Wethersfield to improve its condition before moving forward with dental implant placement. Your dentist will not recommend dental implants if the condition is rampant and causing other dental issues like inflammation of the gums, loose teeth, or causing your teeth to currently fall out. How can a dentist help you to receive dental implants? If you really want dental implants and want to improve your overall health, you can seek periodontal therapy from your dentist. Periodontal therapy is the deep cleaning of your teeth and gums to promote healthier, stronger, gum growth. Usually, your dentist will preform scaling and root planing. Scaling is the intricate cleaning between teeth and below the gum line. Root planing is smoothing the tooth roots to promote healthier, clean gum growth. If you would like to explore periodontal therapy or possibly getting dental implants, don’t hesitate to reach out to your local office to schedule a consultation. Here at Dolan Dental, we know that everyone wants a healthy, complete smile. If you’ve lost teeth due to gum disease and need to restore your oral health, you can rely on our dental team to provide our best services to you. Give us a call to schedule your next appointment with us! Comments Off on Can I Get Dental Implants in Wethersfield with Gum Disease?